NGO Mondo Women’s Fund promotes women’s entrepreneurship and welfare in the destination countries of Mondo. A number of women in the rural areas of Mondo’s destination countries lack the skills and knowledge to provide for their families. Mondo has conducted entrepreneurship and farming courses for women in the Shianda village of Kenya, and developed the production of shea butter and basket weaving in the Kongo village of Ghana. In both of these countries, we have also helped to establish cooperatives that create better chances for women to earn an income. In Kampala, Uganda, we have helped women with disabilities to establish their own little sewing atelier, and we still support its progress. In Afghanistan, we have offered women courses on the English language and computer literacy, and additional training for midwives. Courses, trainings, and cooperations guarantee women a bigger income, which in turn guarantees families their financial independence, food reserves, and education for children. Women, who are not able earn their own income, can get additional income support by owning goats. A goat and its kids act as support during tougher times, when family members’ hospital– or school fees demands expenditures. Then, reselling the animal becomes a good way to compensate costs. Night Nalwoga (35) was left wheelchair-bound as a child due to poliomyelitis. 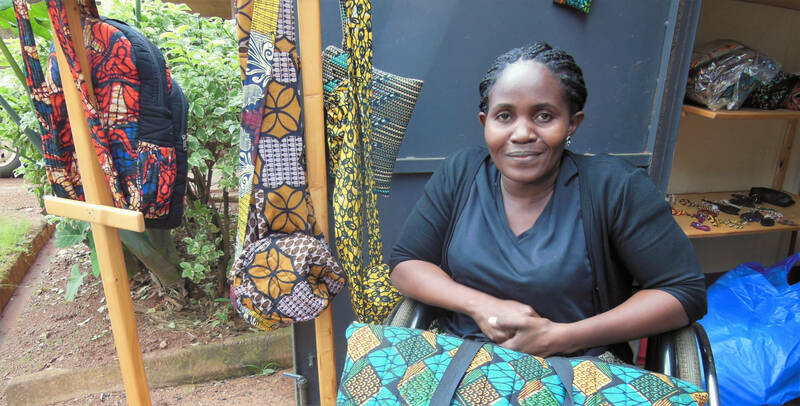 Night loves working at the Kampala Disabled Initiatives atelier – which was established with the help of Mondo – because it has a great atmosphere, and she gets the feeling that people are “doing their own thing” there. She says that through collective work, the women have learnt how to support and trust each other, work hard, and be more independent.